I picked up Creme of Nature Argan Oil Moisture & Shine Shampoo when I ran out of liquid shampoo, and now wish I had left it on the shelf! Product Claims: This sulfate-free formula nourishes and adds brilliant shine, while gently cleansing and detangling. Ingredients: Aqua (Water), Trideceth-7 Carboxylic Acid, Decyl Glucoside, Glycol Stearate, Polyquaternium-10, Argania Spinosa Kernel Oil, Sodium Hydroxide, Disodium EDTA, Quaternium 15, Fragrance, Methylparaben, Propylparaben, Methylchloroisothiazolinone, Methylisothiazolinone, CI 14700 (Red 4), CI 19140 (Yellow 5). Thoughts: This definitely cleansed my hair but not gently. For me, it was similar to a clarifying shampoo; it left my hairclean, but dry and matted. Detangling was not an option in the least. I've used the old CON shampoos, and this just does not compare. This shampoo is an amber-tinted liquid. It produces a heavy lather with minimal product. The fragrance reminds me of sensual amber body products. There are a number of rave reviews for this product. That just goes to show what works for some, doesn't necessarily work for everyone. 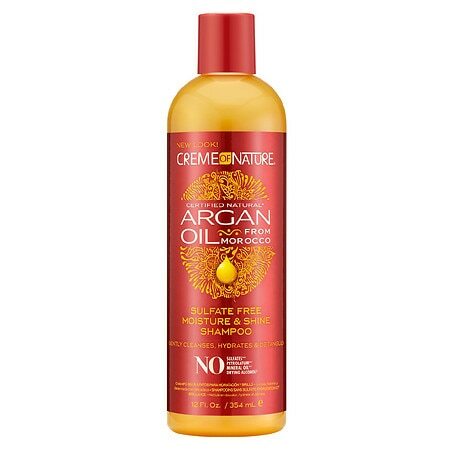 Creme of Nature Argan Oil Moisture & Shine Shampoo retails for $6-$10 for 12oz; it is available on-the-ground in super stores, pharmacies, and beauty supply stores that sell hair products, and also available online.